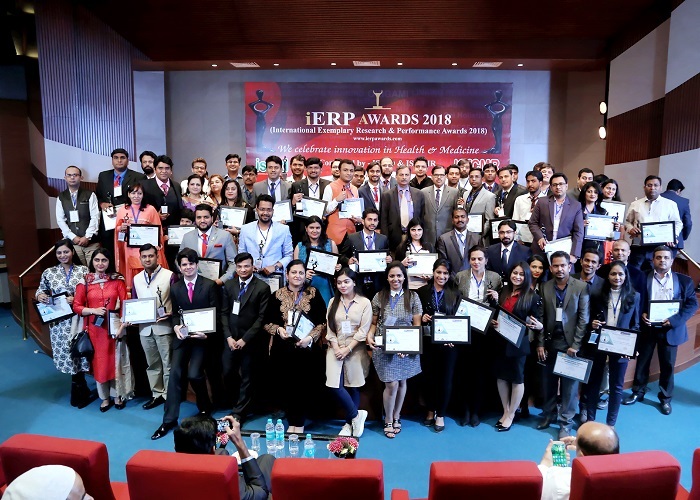 26th February 2018, India witnessed the first edition of International Exemplary Research & Performance Awards popularly called iERP Awards. 26th February 2018, India witnessed the first edition of International Exemplary Research & Performance Awards popularly called iERP Awards. The ceremony received overwhelming participation from medical professionals all across the country. More than 150 medical professionals and researchers from more than 20 states were awarded in 100+ categories for their outstanding and exemplary work in the field of medicine and healthcare. The awards were dedicated to ancient Indian stalwarts of medical science, namely, Sushruta (the Father of Surgery) and Charaka (Indian Father of Medicine). The medicos were honoured broadly in 5 categories, i.e., Allopathy, Dentistry, Homeopathy, Ayurveda & Medical Research. The awards are a feather in the cap of renowned medical professionals including Deans and HoDs of Medical and Dental College from all the domains of medical science for their excellence in the field of healthcare delivery, research, new innovations and rural health and social service for the betterment of society and health education. The jubilant ceremony was held at the prestigious Lakshmipat Singhania Auditorium of PhD Chamber of Commerce & Industry, August Kranti Marg, New Delhi. Event ceremony was honoured with the presence of Shri Imran Hussain ji (Delhi cabinet Minister for Food & Civil Supplies, Environment & Forest and Election) as Chief Guest for the event. Doctors & Researchers were awarded by Dr Rajesh Malhotra (Professor & Head, Department of Orthopaedics, Chief, J P N Apex Trauma Centre, AIIMS, Delhi, B C Roy National Awardee-Eminent Medical Teacher 2014) and Dr V P Gupta (Principal, Professor of Ophthalmology, UCMS, Delhi). In the opening address, Ms Medha Gupta, Event Director, highlighted that it was a difficult process for the independent jury to shortlist awardees from the elaborate list of potential and deserving nominations. The event was conceived by International society for holistic dentistry and International society for contemporary medical research (Registered with Govt. of Uttrakhand, India) and powered by Origami (technology partner). These Societies publish their fully indexed, monthly, peer-reviewed journals - International Journal of Contemporary Medical Research & International Journal of Contemporary Medicine, Surgery & Radiology which adheres to all publication guidelines of MCI and provide a forum for the presentation and criticism of original, innovative and thought provocative ideas in medical and allied specialties. Articles published in the journals go through the rigrous double-blind peer review and get high citation.